CONCERNS HAVE BEEN raised over the legal advice given to Kilkenny County Council over the construction of a bridge in the city. Independent Councillor Breda Gardner has raised the concerns and challenged the council to provide proof of its “assertion” that councillors were informed in June that works were due to be undertaken on the Central Access Scheme (CAS) or that expenditure had been committed. She said that a motion is being moved to call for a special council meeting on the bridge, proposing that the council executive immediately halt works on the CAS until they can prove they have fulfilled their mandatory obligations. She has concerns about the information that the legal advice given to the council at a meeting in July about the CAS was based upon. Gardner has now sought a second opinion on the advice given to council members. The disputed bridge over the River Nore is being constructed under the CAS. Protesters against the bridge have been consulting with legal experts over this contract. They are hoping that information they have on the contracts and process for the bridge will lead to a halt in work by next Wednesday. Two protesters were arrested while attempting to stall trucks entering the bridge construction site earlier this week. Kilkenny County Council have not yet commented on Cllr Gardner’s claims. The protesters have now begun to wear Kilkenny hurling jerseys, saying they won’t remove them until work has stopped. 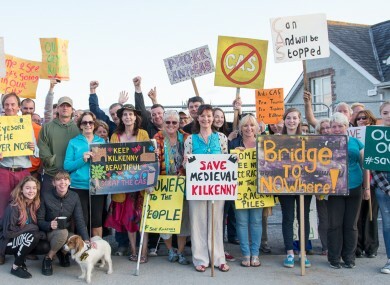 Email “Councillors take steps to halt works on controversial Kilkenny bridge”. Feedback on “Councillors take steps to halt works on controversial Kilkenny bridge”.